For those with smaller gardens who are looking for a flowering tree, Prunus ‘Elvins’ could be the answer. It is a tree that is also widely used in street plantings where its size means that it requires little to no pruning. A very pretty ornamental flowering tree, Prunus Elvins is at its best in spring when it is covered in masses of flowers. This is a flowering plum that will grow into a small tree with a rounded shape. Upright at first, however forming a nice rounded shape over time, P. Elvins will grow in part shade, however flower more prolifically in full sun. Flowers open white turning to pink and are held close to the branches and as this pretty tree reaches only around 3 – 4m in height. This is an excellent choice for a smaller garden, also widely used as a street tree and in Japanese style gardens. A humus rich moist but free draining soil and full sun are the main growing requirements. 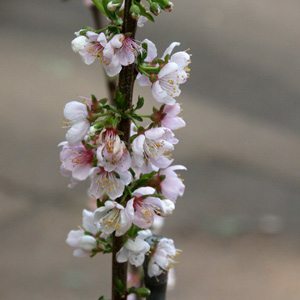 Prunus Elvins requires little pruning other than the reman of damaged branches, can be pruned to shape if required, however this is generally not required.